On Monday, I met the President of the United States. This isn’t something I ever expected to happen, but it really did happen! Let’s talk about it. I wish I could say I met Barack Obama because I cured cancer, or I won the World Series, or he really likes this blog and agreed to do an interview. None of those things are true, though I can’t discount the possibility that he reads the blog. No, the reason I met Obama is much less exciting. I have a friend who works at the White House. And yesterday, Obama visited Boston for the opening of the Ted Kennedy Institute. So my friend hooked me up with a once-in-a-lifetime opportunity. I participated in the Presidential motorcade as a volunteer. This meant that I got to drive one of the twelve-passenger vans that holds the press and guests of import. I was given very little details on what exactly I had to do. It was very much a chaotic, confusing atmosphere. Maybe this was for security reasons. I wasn’t briefed until I arrived at Logan Airport. And now you may be asking yourself: Wait a minute, the Presidential motorcade drivers are volunteers? And the answer is inexplicably: Yes. Yes, they are. Here is a New York Times article that explains the process. Upon arrival at Logan, the volunteers (six of us) picked up the vans from Budget. Yes, even the Presidential motorcade rents from Budget. We were briefed by the motorcade staff. Follow the person in front of you. In the event of an emergency, use common sense and get to safety. If you fall out of the motorcade, don’t try to get back in line. Don’t cause any accidents. 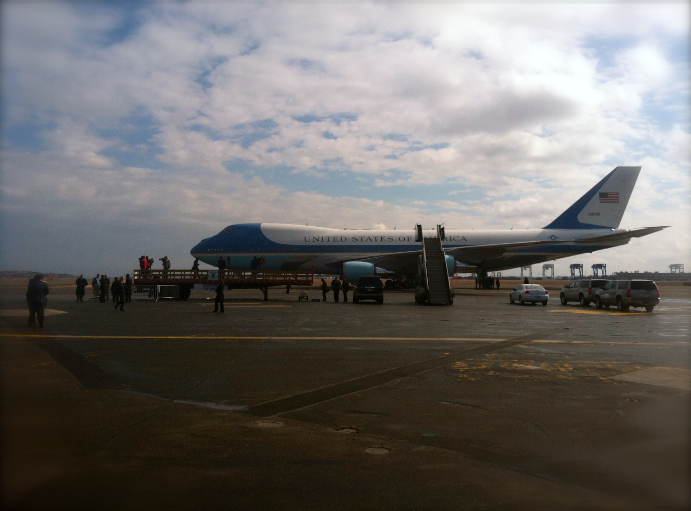 From there, I drove one of the vans onto the tarmac and lined it up for the motorcade. I ended up switching cars because, as I learned later, the vehicle I was driving was going to be used for the military advisor and the nuclear football. * And, uh, I was not fit to drive that. *I wasn’t supposed to know this, and I don’t think you are either. It’s top secret stuff. The guy that told me regretted it immediately. 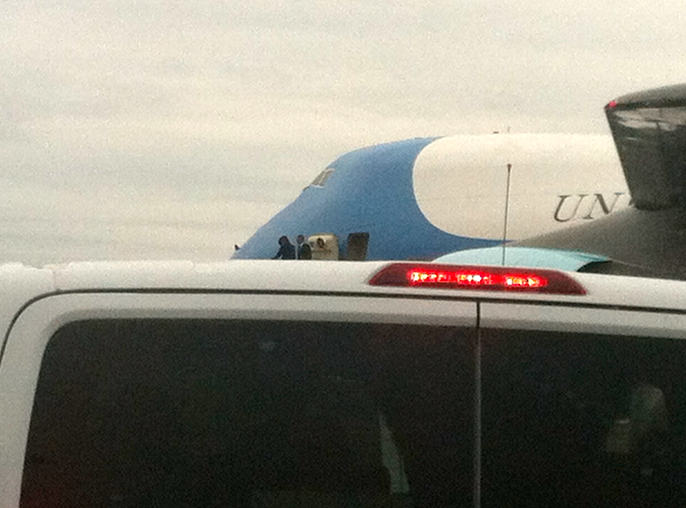 And here’s a blurry photo of the President and First Lady as they exited the aircraft. We booked it. The roads and highways were all closed. Traffic laws did not apply. We cruised through red lights and drove on the wrong side of the road and weaved through the back streets of Boston at 70mph. Thousands of people waved and cheered us on. It was great. Ten minutes later, we arrived. I didn’t get to see Obama’s speech at the Ted Kennedy Institute because I had to remain with the vehicle at all times. There was a lot of down time. I mostly sat in the car and tried to take it all in. When the speech ended, the volunteers were ushered off to a private area. 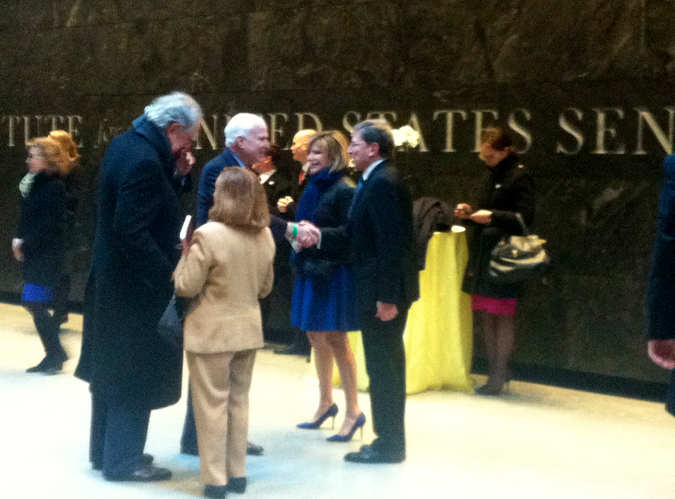 All of a sudden – there’s Elizabeth Warren standing right in front of me! And Maria Shriver! And John McCain! And let me tell you something – John McCain looks good. He’s a lot taller than I thought he would be. I remember people were seriously concerned that he would die in office if he was elected President in 2008. I’m happy to report that in 2015 Senator McCain looks great. We were then led to a smaller private room, where the President was told that the motorcade drivers had arrived. He looked at us and proclaimed: These are the greatest drivers in Boston! I’ll be sure to mention this the next time I get pulled over. I tried to laugh at Obama’s comment, but all I could think was HOLY JESUS CHRIST THE PRESIDENT IS STANDING RIGHT THERE. Joe Biden was in the room too. All I could hear was him shouting at everyone as we lined up for the meet and greet. WHAT’S YOUR NAME? WHAT’S YOUR NAME! WHAT’S YOUR NAME?! He really wanted to know our names. Finally, I walked up to him, I shook his hand, and I told him my name. Next to Biden was President Obama. I was so, so nervous but I managed to introduce myself and eek out a nice to meet you, Mr. President as I shook his hand and stared intimately at his eyes. He said good to see ya, Jeff before moving on to the next person. We lined up for a picture – three of the us on each side – and smiled into the lens of the official White House camera. I will post the picture as soon as I can. After the picture, I shook Obama’s hand one more time because why not. He has soft hands and a very gentle shake. And then the fun was over – back to the motorcade. We drove over to Cambridge where the President and twenty other dignitaries had lunch. Again, we waited in the van while the President undoubtedly engorged himself in New England Clam Chowder. 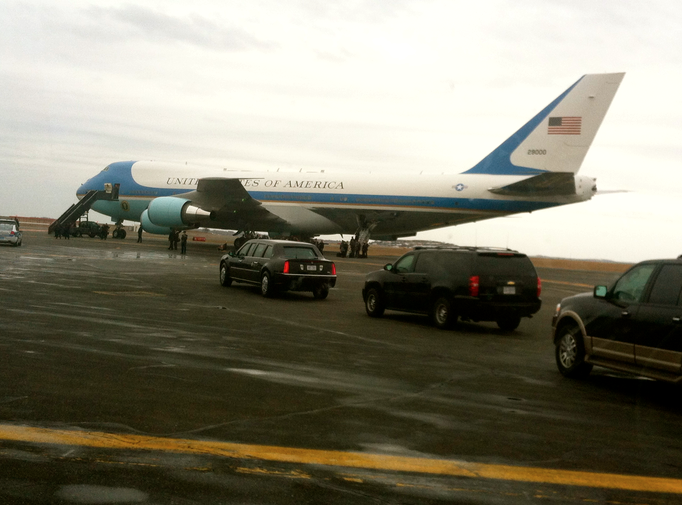 After about an hour, we drove back to the airport where we saw the President board Air Force One. And then the plane took off. And then I returned the rental van. And then I ate a burrito. I realize that not too many people get to meet the President and shake his hand. It was truly an honor. I’m lucky to have a friend with the sweetest of connections. I guess it’s good to know that even a kid from the rough and unforgiving streets of Cortlandt Manor, New York, can one day meet the President.